Barcelona forward Lionel Messi has been named Spain's player of the month - the first time he has won the award. The prize has only been given out since the 2013-14 season, but five-time Ballon d'Or winner Messi had not won any of the previous 22 awards. The Argentina skipper, 28, has finally claimed it after scoring six goals in five La Liga games in January. Real Madrid's Cristiano Ronaldo has won the award twice since it was introduced in September 2013. Atletico Madrid pair Diego Godin and Antoine Griezmann, along with Real Sociedad striker Carlos Vela, have also won it twice. Messi is only the second Barcelona player to win the award following Neymar's success in November. 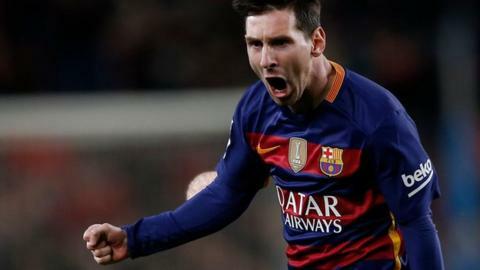 He scored a hat-trick against Granada, netting further goals against Athletic Bilbao, Malaga and Atletico Madrid, as La Liga leaders Barcelona won four of their five league matches in January.